Even though I don't heat style my hair often, with the exception of the hair dryer used 2 to 3 times a week, my locks are unruly, dry and very prone to breakage and split ends. Whatever the reason (vitamin deficiency, being too rough when brushing - who knows), I am always looking for the miracle product to prevent and fix my mane issues. I chanced upon this fabulous product after scouring online forums for some directions and want to share with you this fab and cheap product that silkens my lack-luster locks. This treatment wax packs a great punch. It contains hydrolysed proteins, lanolin and henna leaf extract which are known to nourish and lock moisture back into hair, smooth and add shine. 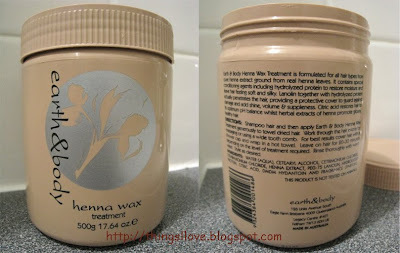 Used after shampooing in place of your regular conditioner, its rich and thick texture goes on hair like a mask. I leave it in my hair for 3 minutes before rinsing and voila, I have semi-decent manes that is soft, silky, less frizzy and easier to style. I also find that I have fewer breakages with regular use of this treatment. The split ends also did not worsen, which was great but nothing other than a chop and snip will get rid of those completely. Seriously, this stuff is almost as good as the pricier L'oreal Asolut Repair masque (review of that coming soon) and it is 10% of the price for the same amount - how can you say no and not give this a try? Unfortunately, Priceline have decided to no longer stock this amazing product, any chance you know anywhere else you can buy it? It was a good product and I wouldn't know where else to look for the same items but there are now good alternatives on the market. I would suggest trying the Dove Therapy Nutritive Solutions Nourishing Oil Care. It is an amazing hair treatment, smells great and readily available in the supermarkets at very good prices. Hee, I found this webpage for the same reason as the previous commenter! :) Damn, we miss that product!